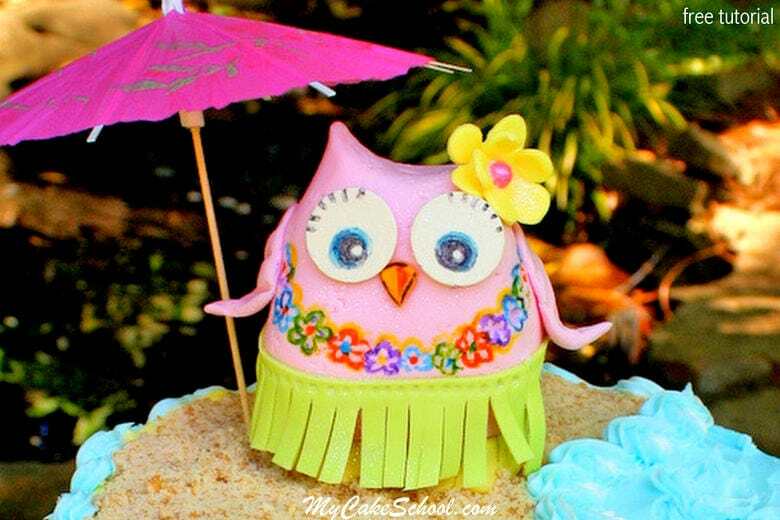 Hi everybody~ Today’s Owl Cake Topper tutorial is a fun one, especially if you love an owl in a hula skirt! If you’ve followed our site for a while, or if you’ve scrolled through our oldies in the blog, you may have seen an owl tutorial that we made a few years ago called “Owls in Love”. I mentioned in that post that owl-themed prints, bedding, cakes, and decor were popping up everywhere…and guess what? They STILL are! I think that our love for owls is here to stay–so I thought we’d celebrate with another owl tutorial. It’s luau time! Okay–So, just as in my previous post, our 3-D owl cake topper is filled with rice cereal treats goodness. 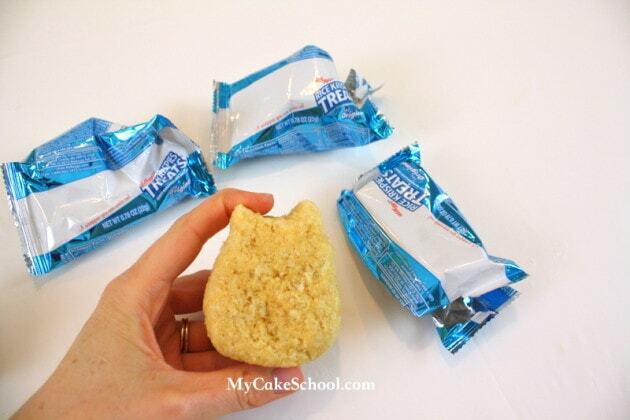 I used 3 (22g) Rice Krispies Treats to mold and compress into the owl shape that you see here. I ate half of another one before realizing that my owl maybe needed some feet (mainly because I wanted a little more height since she would be wearing a hula skirt.) 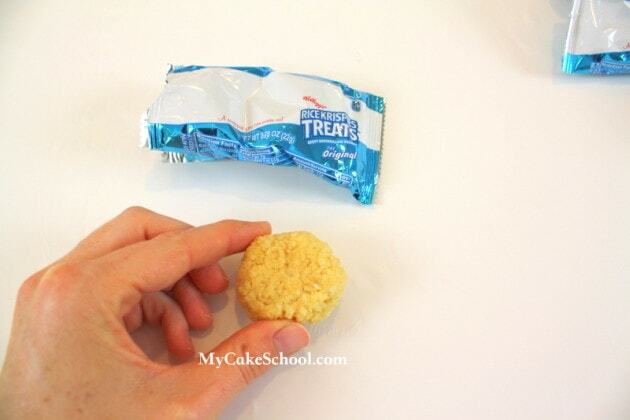 — SO, the other half of my rice cereal treat was shaped into the “feet” that you see here. I shaped this circle into more of a heart shape, which you’ll see in a minute. Next, I lightly coated my owl with a little vegetable shortening (for “glue”) and then covered my owl shape with two layers of fondant. I used two layers because after the first layer, it was still a little bumpy (as you see below). By the way, I’m using Satin Ice brand fondant which is tinted with a little Americolor Deep Pink. After covering the owl with the second layer of fondant, I smoothed over my owl and redefined the ears. Remember our feet? I shaped that circle of fondant into almost a heart shape, and covered with yellow fondant. I used a knife to add toe impressions. Don’t worry too much about the feet–they will be almost completely hidden unless your owl is going to wear a really short skirt! Now for an optional step– If you feel the need to anchor your owl, you can use a lollipop stick to create a hole in the bottom of your owl that travels through the feet and partially into the body. My owl was stable and balanced and so I didn’t feel that I needed to use the lollipop stick…but if I wanted to, I could have easily pushed it into the hole before placing on the cake. I “glued” the body of the owl to the feet with piping gel. Melted candy melts, royal icing, or piece of dampened fondant would have worked well too. There are a few things happening here. 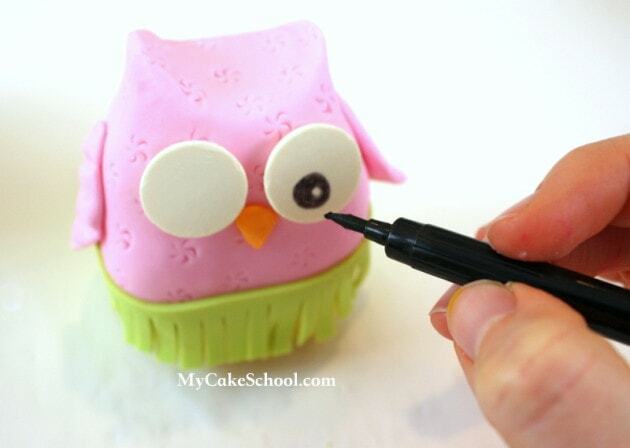 First, I used a piping tip to make pinwheel impressions in my owl’s fondant. This was a tip 106. Impressions are optional–but if you’d like to spice things up, your piping tips are always a great place to look first! I also rolled out a strip of fondant (tinted Americolor Electric Green) and fringed it with my knife. 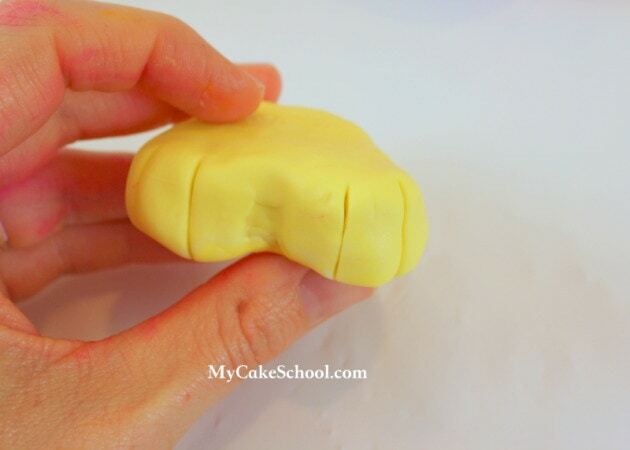 To speed up your dry time, you can knead a little tylose into your green fondant (or even use gum paste). 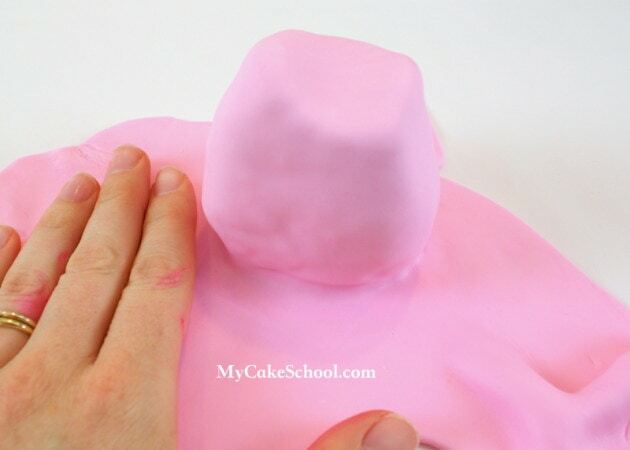 If you are working with straight fondant, allow it to set up at least a few minutes so that it will be easier to handle. 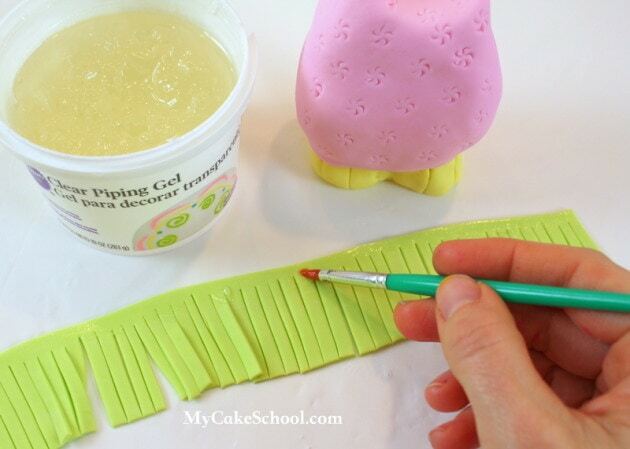 Piping gel is my glue of choice in today’s tutorial but you could also use sugar glue or even a little bit of water. My owl’s eyes are Merckens Candy discs…but Wilton Candy Melts would work too! You could also use circles of fondant or anything else that you may think of ;0) I added a small triangle of orange fondant for the beak, and fondant tear drop shapes for wings. Everything that I just mentioned was glued on with piping gel. I was able to draw on the eyes pretty easily with my Americolor food coloring pen. However, some candy discs are waxier than others and don’t accept coloring pen so well. You can use fondant circles or even a crusting buttercream to pipe on the eyes if you have trouble drawing on your chocolate discs. That little green circle is the top of a bubble tea straw cut to the same height as the cake. Whenever my cake toppers have a little weight to them, I like to sit them on top of a support of some kind just to ensure that they don’t sink. For an even more realistic look, we crushed Vanilla Wafers to create sand. 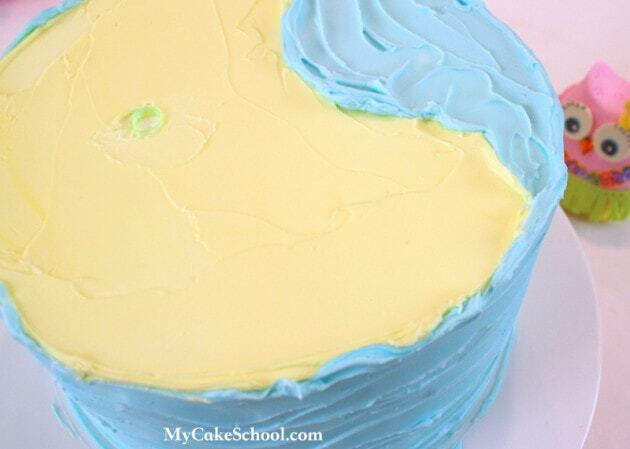 I used my small spatula to give us the look of waves–and then used my Wilton star tip 21 for borders and little accents. I hope that you enjoyed our tutorial! Be sure the let us know if you give her a try–we’d love to see! She couldn’t be any cuter, and I love the ocean waves! 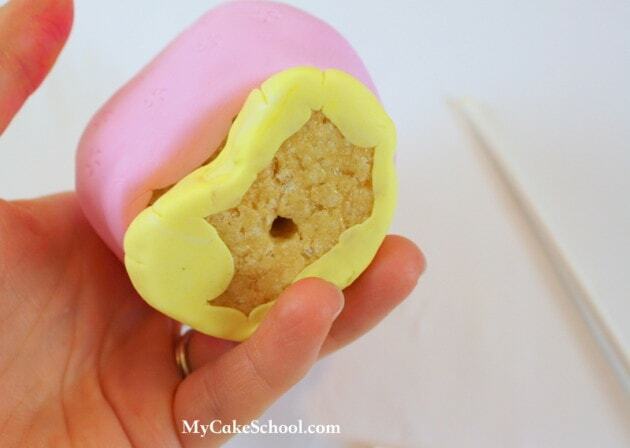 I saw this on Pinterest and had to check it out – what a great tutorial and such a cute cake!! I love it, thank you so much for sharing! Oh my gosh!! This is so Stinking cute!!! How fun for the summer!!! I love it!!! Way to go MCS!!! What size cake pan and how many tiers is this cake? 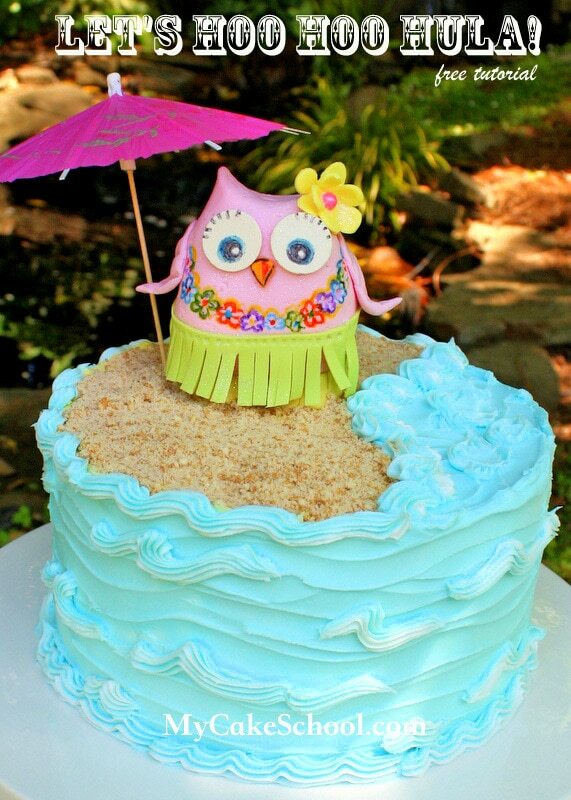 This is so cute and I love how you did the beachy cake! This is such a fun summer cake with a spin on the owl theme. Great job!! LOL, this is just so very cute! You made me smile :) I love the way you made the waves on the side and top of the cake! Thanks, Anita, and I’m glad the email problem has been solved. This is absolutely genius!! I really liked it. This is so adorable, I love owls and your site. You are so full of great ideas and helpful tutorials. I have never made one of these cakes but I get a huge kick out of looking at your stuff, amazing I am in awe. Thank you for this wonderful site.